Now, here is a vocation I haven't thought about recently (although some days, I have to say, it sounds mighty appealing! ), but Theresa Thomas just wrote an article about her sister who is a modern-day hermit. As the article states: "According to definition, a hermit withdraws from the world, and spends most of the day in seclusion and silence, praying and fasting. A hermit publicly professes the evangelical counsels of poverty, chastity and obedience, and follows a rule of life that the local bishop has approved. Mary’s specific rule and vows reflect her vocation of being a hermit of “crucified love”, which means her “plan of life” is centered on Christ crucified. Mary begins her day, fittingly, with Mass and spends many hours praying before the Blessed Sacrament. Because her “charism” is crucified love, she makes certain to spend the particular hours of noon to 3 p.m. in prayer and Adoration in church. Additional prayer and good works-physical and spiritual – accompany her time." Pondering space, at least for me, definitely makes the case for God. How could such an amazing universe ever be created via chance? But faith and science have had an uneasy relationship through the years. I would like to start this article by saying that I am not, in any way, whining. I merely want to share some facts, including real dollar and cents information, on what life is like with a huge student loan and why something truly needs to be done about this growing problem. I was very fortunate. I received a large scholarship for my undergraduate education, and my father generously covered the small percentage that we needed to pay for. I attended graduate school one class at a time which was paid for by the college since I worked there full-time. My husband was not so lucky. He came from a poor background. After high school, he worked for several years and helped support his family. He returned to college in his mid-twenties. By attending a community college and a four-year institution at the same time, he was able to complete his undergraduate degree in three years. He then went on to law school – working full-time and attending school part-time in the evenings. In 2001, he graduated the month after our first child was born with $111,000 in debt. That first student loan payment came due that November. Even with consolidating loans and the thirty-year graduated payment plan, the bill was for $800. It could have been a million dollars. The reality was, we simply didn’t have the money. We firmly believe in paying our bills, but there was no way we could pay that one. We worked with the Department of Education which holds the loan and were able to obtain a forbearance. We would pay $300 a month. It was a stretch, but we were able to pay it. I believe we paid that for two years. We then went up to $450 a month and $600 and finally the full amount which we have been paying for several years now. We currently pay $860 a month – more than we pay for our mortgage payment. The issue is that during the years we couldn’t pay the full amount, the interest kept accruing. At its highest point, the loan reached $130,000. We have now been paying on this loan for over ten years. During that time, we have paid $73,964.98, yet the principal amount is still $126,082.58. I will repeat that so that it can sink in – we have paid over seventy thousand dollars yet the amount we owe is still fifteen thousand dollars more than we started out owing! Can you understand why this can make people throw up their arms in frustration? As much as I would like to honor this debt and pay off this loan, pending an unexpected financial windfall, we will most likely die before it is paid off. Meanwhile, it has impacted every financial decision we have made. It affects our ability to save for our children’s education and retirement. Plus, there is the psychological weight of knowing that we owe this money. I stated in the beginning that I was not whining and that is true. We have been blessed. We are able to make the payments. My husband’s education allowed him to pursue a career which gives him fulfillment and allows me to work part-time from home and home-school our children. Plus, at least he received both an undergraduate and graduate education for the amount we owe. Today, that amount of loans can easily be accumulated simply obtaining an undergraduate degree. If both a husband and wife have this amount of loans, the result is truly financially crippling. Unlike home loans or car loans, which are based on income and what you are buying and can be made as prudent financial decisions, student loans are based on hope – the hope of future earnings. I know that when we were signing for these loans, we knew the amount was large, but we had no concept of what it would take to pay them. We certainly didn’t have the money to pay for the classes out-of-pocket. They were necessary for him to obtain his education. We simply hoped it would all work out. Today, as a parent, I don’t know how to advise my children. I want them to be able to fulfill their potential and obtain a higher education if that is what they want. At the same time, I know the reality of living with large student loan debt. Something must be done about the high cost of higher education and the burden of student loans. This is a very real issue that isn’t going away anytime soon. The pastor of a small church received an envelope marked, "Please give to Harry the usher." The pastor put it in his pocket and didn't think much about it until he came across Harry on Sunday and then remembered to retrieve it for him. I'm sorry I don't know your last name, but then you don't know mine either. I'm Gert, Gert at the ten o'clock Mass every Sunday. I'm writing to ask you a favor. I don't know the priests too well, but somehow feel close to you. I don't know how you got to know my first name, but every Sunday morning you smile and greet me by name, and we exchange a few words: how bad the weather is, how much you like my hat, and how I am late on a particular Sunday. I just wanted to say thank you for taking the time to remember an old woman, for the smiles, for your consideration, for your thoughtfulness. Now for the favor. I am dying, Harry. My husband has been dead for sixteen years, and the kids are scattered. It's very important to me that when they bring me to church for the last time, you be there to say, "Hello, Gert. Good to see you." If you are there, Harry, I will feel assured that your warm hospitality will be duplicated in my new home in heaven. It was so easy to be a parent . . . before we had kids! I think most of us had some preconceived idea of what type of parents we would be before we had children. After all, we read the parenting books, websites, etc. We were educated and well-versed in child psychology! Our children would always be well-behaved and polite and would never embarrass us. We may even have explained the "right" way to parent to some of our friends. And then, we actually had these children, who from day one were people in their own right with their own ideas about when they would sleep, what they would eat, and how they would behave. And we were humbled . . . sometimes daily. I know I now try to refrain from giving parenting advice, unless directly asked, or I think it is REALLY, REALLY important. Because even though I have nearly 11 years of parenting experience under my belt, every child is different and what works with one will not necessarily work with another. Instead, I try to lend a sympathetic ear and reassure the struggling parent that this issue, whatever it may be, will pass. I have to remind myself of that frequently as well. I had the pleasure of sharing this letter from a loving mother to her daughter today on Catholic Lane: A Letter to My Daughter. The heartache of teen romance is real. Looking back, I can remember the pain as if it were yesterday. This young woman is lucky to have a mother that understands. I hope that when the time comes, I can help my children navigate the difficult shores of young love the first time their hearts are broken as well. I have such an appreciation and respect for those who work in hospice care. Hospice truly allows people to "die with dignity" and respects life all the way to its natural conclusion. Karen Ann Quinlan was a young woman who, due to an accident, spent many years in a coma before her death. In her memory, her parents establish the Karen Ann Quinlan Hospice in northern New Jersey. From its relatively small beginnings, today it serves more than 100 patients a day. In his famous 1963 Letter from Birmingham Jail, he even relied upon the Catholic natural law tradition. King wrote: "One may well ask, 'How can you advocate breaking some laws and obeying others?' The answer is found in the fact that there are two types of laws: there are just and there are unjust laws. I would agree with St. Augustine that 'An unjust law is no law at all.'" He continued, "Now what is the difference between the two? How does one determine when a law is just or unjust? A just law is a man-made code that squares with the moral law or the law of God. An unjust law is a code that is out of harmony with the moral law. To put it in the terms of Saint Thomas Aquinas, an unjust law is a human law that is not rooted in eternal and natural law." A law "that is out of harmony with the moral law" can never be regarded as "settled" as long as there are men of conscience, men of determination and men who understand that our nation will be judged by the respect we give to every person - even to "the least among us." The Obama Administration announced that Catholics MUST pay into insurance policies that cover abortion, contraception, and sterilization — NO conscience clauses will be accepted. Today is the 39th Anniversary of Roe v. Wade. I think that most of the girls/women who have abortions do so because of fear - fear of what their parents will do to them if they find out they are pregnant, fear of what their boyfriend or husband will do, fear of the ways their lives would have to change if they had a chihttp://www.blogger.com/img/blank.gifld, fear of what they might have to deal with if they give birth to a child who has already been diagnosed as being "different." Those fears are very real and very scary. Having a child, even under the best circumstances, can be difficult. But, in the midst of the fear, God is there. If He has sent someone a child, there is a reason and that child is a gift. Columbia Magazine dedicated its January 2012 issue to pro-life articles. One of the most beautiful is Love Without Limits about those who are raising children with Down Syndrome. Because Down Syndrome is frequently diagnosed before birth, these children are unfortunately aborted at a very high rate. Those who have opened their hearts and are raising children with Down Syndrome are sharing their stories to help alleviate some of the fear of those who are facing such a diagnosis. In the January 2012 issue of St. Anthony's Messanger, Charity Vogel shares a beautiful article on finding peace in cleaning her wood floor: Meditations on a Wood Floor. I center myself while I wipe those floorboards. I focus my thoughts, and oftentimes a decision or two comes to me in that time of concentration as well. Great monastics have taught for centuries that work can be prayer; that, in fact, it should be if we want to live in the world in the proper manner. The closest I've ever come to understanding what they mean is when I'm bent over a bucket, rinsing out my rag for another swipe. Ora et labora. Work and pray. Pray and work. Peace and prayer can be found in unusual places - in the chores and activities that fill up our daily lives. The rhythmic, repetitive motions of many chores, such as washing dishes, or folding laundry, can be very soothing at times and allow the mind to focus and pray. Sometimes, we simply must find peace where we can! In Catholic circles, it can be hard to be the mother of a small family. When everyone around you has more than four children, it can be hard to be the mother of one or two. How can you complain that you are tired, or worn out, or that life is just not the bliss-filled ride that people sometimes make motherhood out to be, when the people around you obviously are juggling so much more? This article by Simcha Fischer is so good and very honest: To the Mother with Only One Child. It's worth reading no matter how many children you have. It isn't easy being an introvert. Susan Cain knows this and has written a very compelling book about why the world needs us, even if it doesn't think so! "Quiet: The Power of Introverts in a World that Can't Stop Talking" is a very interesting study of the differences between introverts and extroverts and how we balance each other. She examines when the world started to view extroversion as the ideal and some of the negative consequences of that. She also looked at some of the ways introverts try to make themselves appear more extroverted. In doing research for this book, Cain attended a Tony Robbins seminar designed to help people be more successful in business and in life. Honestly, just reading about it made this introvert tired! Yet, introverts can be leaders, too, and Cain explains how to use our strengths to be effective in leadership roles. She also examines how today's classrooms are designed to support extroverts with lots of group learning. While that in itself isn't a bad thing, Cain explores why students need independent learning as well. In fact, contrary to popular belief, she offers creativity actually thrives on independent pursuit rather than group brainstorming. Still, introverts often do need to act like extroverts, at least some of the time. Most of us are able to do this - to conquer our fears of speaking in public or working in groups - if we believe in the cause or project we are working on. 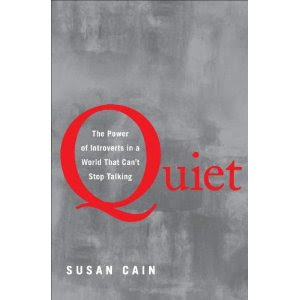 Cain offers suggestions on how to make the most of both our introvert qualities and the times we need to act out of character. "Quiet" is an enlightening book and emphasizes how and why the world needs introverts. I would recommend it to any introverts as well as to extroverts married to or raising introverts. It is always helpful to understand the other side. Jesuit Father James Martin, the author of "Between Heaven and Mirth," will be the keynote speaker at the 5th annual Catholic Women's Conference on April 21, 2012 at the Bellamy School in Chicopee, MA. He will talk on “Why Joy, Humor, and Laughter Are at the Heart of the Spiritual Life.” He also will speak about Ignatian spirituality and how to make a simple yet meaningful prayer each day. He notes in his book, "The Jesuit’s Guide to Almost Everything,” that “When we feel resistance to something in prayer, it’s often because we’re resisting God’s invitation to growth.” The Women’s Conference is issuing an invitation to all to grow! In addition, Sister of Notre Dame Mary Johnson of Emmanuel College also will speak about “The Contemplative in You.” She is a noted sociologist and author. They will bring laughter and a renewed spirituality to the diocese. To register call (413) 452-0812. Take a Catholic Course for Free! Catholic Courses is a new company offering some very well-known Catholic scholars speaking on topics such as "The Hidden Meaning of The Lord of the Rings," "Saints with a Past," "Shakespeare's Catholicism," and "Unveiling the Apocalypse." Courses are offered via DVD, CD, or download. The best news is that you can download your first audio course for free! Visit http://www.catholiccourses.com/ for more information. Many of you no doubt remember Roma Downey from the popular television program, "Touched by an Angel." Now, she is the producer of "Little Angels" - a series designed for preschoolers and kindergarteners. The videos are educational, with the angels helping to teach children the alphabet, numbers, and basic math using figures from Bible stories to help make their points. I was feeling pretty badly today - no specific reason, really. It's January - for me, that seems to be reason enough. (Is it spring, yet?) Add in hormones, stress, lack of sleep - bad mental health seems to go hand in hand with all of it. In any event, I happened to open my January 2012 copy of St. Anthony's Messenger and came across this article by Susan Hines-Brigger: Are You There, God? Hines-Brigger shares some of the difficult things going on in her life right now and how they affect her relationship with God. It can be very hard to trust in God when you are hurting (whatever the reason behind that hurt). It can be hard to see any value to life, to feel blessed at all. In any event, this article was just what I needed to read today - my own personal message from God from the hands of a fellow writer. If you are going through a rough time, it might help you, too. While obviously NOT giving up the fight against abortion, a large focus of the pro-life effort in Massachusetts this year is fighting against Doctor-Assisted Suicide. It looks like there will be a question on our ballot in November to make this legal. We can't let this happen. We need to respect life from conception to natural death. 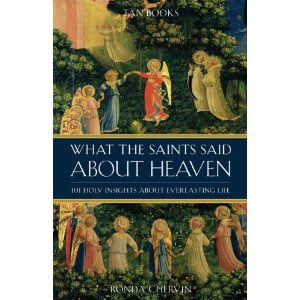 I'm adding What The Saints Said About Heaven: 101 Holy Insights On Everlasting Life to the books I really want to read list. February is known as “Burnout Month” in homeschooling circles. The busyness of the holidays have come and gone. Field trips and outside activities are at a minimum due to cold and snow. Yet there’s still three to four months to go. It’s the month many homeschoolers begin to doubt their resolve and question their educational approach. Some even begin to think about throwing in the towel. For this reason, Homeschool Connections, a Catholic online curriculum provider, is very happy to announce something extraordinary: Refresh! Midwinter Virtual Conference. Beginning in mid-January and through the end of February, Catholic homeschoolers will get a chance to renew, rejuvenate, and recharge. Homeschool Connections’s Refresh! Midwinter Virtual Conference! is a series of free webinars (online seminars) with popular national speakers who will provide both inspiration and practical help for the everyday task of homeschooling. Regina Doman: Which Comes First, the Character or the Plot? Andrew Schmiedicke: Is Our Faith a Fairy Tale? Speakers and topics are still being added. Time to Simplify . . . Again! Two years ago during Lent, I embarked on a forty bags in forty days project. The http://www.blogger.com/img/blank.gifidea, which came from Faith and Family, was to rid one’s house of forty bags of excess material goods – ideally through giving items away, although some items definitely deserve a place in the trash. I’ve decided it’s time to do it again. No, it isn’t Lent and I most likely won’t be able to accomplish my goal in forty days this time, but I desperately need to get rid of things. We tend to store things long after they have outlived their usefulness. I am not sure why; perhaps we document our life with them. Maybe letting go of them reminds us of our own mortality, with the realization that we will not be taking a U-Haul with us into the next life. Jesus warns us against storing up treasures on earth. There is a reason: I find the more I keep unnecessary items, the more difficult it is to be at peace and in solidarity with Christ’s teachings. I am often distracted by clutter, and there is little doubt others could benefit from my surplus possessions. There is obviously nothing wrong with owning things. We all need some items – things that are necessary for life, as well as things that are simply beautiful and bring us pleasure, and those items which have a strong emotional value. Yet, most of us own many things that don’t fit into any of those categories, items that we don’t use and which could be doing someone else some good. Those are the items I’m seeking to rid my life of. I want to live a generous life. This is one way to do that, a simple way to share what I have been blessed with. I have never regretted giving something away. I have found that generosity is always rewarded. If I am generous with others, I trust that when the time comes that I need something, others will be generous with me. I have definitely found that to be the case. I know I will never completely get rid of all the extraneous items in my life. No doubt, a couple years from now, I will once again desperately need to do a major decluttering. It is one of those on-going battles. Letting go of things is not always easy, however, it is necessary, for both my mental and spiritual health. Let the bagging begin! The January 2012 issue of US Catholic is focused on women and the Church. It offers much food for thought. Kathleen P. Hockey writes about her parish community, where the "church is full on Sunday with women and men serving at the altar, the veiled and jean-clad all kneeling together, worshiping in genuine camaraderie." She continues, "This kind of parish community is why I remain faithful. It gives me hope that in spite of the polarization and injustice so often talked about and bemoaned, in many corners of the church world, tolerance, equality, and charity prevail quietly. "There is one more thing that keeps me faithful. It is the realization that our church is a global church. While I am safe and sound in the United States, both male and female Catholics in other countries are being suppressed or exterminated for the faith. Willingness to die rather than not be Catholic makes the pettiness here seem downright sinful." Here in the U.S., we Catholics can sometimes be downright nasty to each other. It is truly one of my pet peeves. We who call ourselves Christian should be kind to each other. We can disagree, but we should be kind. But, in this country, we have the luxury of being able to practice our faith, and argue about all the particulars. Sometimes, perhaps most of the time, we don't appreciate that fact. People die for our faith all the time. Thank you to Kathleen Hockey for reminding us how blessed we are to be here. Massachusetts Residents: Do You Want to be a Quest Detective? When I started high school, I was eager to start studying Latin. It just seemed so scholarly! I ended up taking three years there and went on to take a year of Ecclesiastical Latin in Graduate School. I'm now teaching my children some very basic Latin as part of their schooling. The January 1st issue of Parade Magazine featured an article by John Kralik, author of A Simple Act of Gratitude: How Learning to Say Thank You Changed My Life . He tells how in 2008, he made a decision to do a year of "thank-yous" - to write notes to all sorts of people who had helped him in one way or another. He writes, "This project transformed my life. I saw how much I had been blessed by so many people in different ways, and acknowledging their blessings seemed to make them multiply. After I thanked colleagues for directing cases to me, they referred more. When I expressed gratitude to clients for paying promptly, they began doing so even more quickly. "Something more subtle occurred, too. With my thank-you notes, I was trying to tell people how much their kindness meant to me. As they responded, that same message was reflected back." He then went on to write A Simple Act of Gratitude: How Learning to Say Thank You Changed My Life about the experience. I put aside the article, planning to write about this week (and so I am!) because I thought it was a wonderful idea. But, then, as if to emphasize the point, I'm pretty sure I became a recipient of one of these letters! On New Year's Day, an old acquaintance from high school wrote me to tell me how much she enjoyed my columns at Catholic Mom and that she had also found my book Letters to Mary from a Young Mother (now available in Kindle format as well) very helpful now that she was the mother of a fourteen month old. That letter totally made my day and I told her so! So, take the time to thank someone today who has made a positive difference in your life - large or small. It could make a whole world of difference to them! Time has gone by quickly, but it has been eight years since I started The Spiritual Woman website. While this blog has supplanted the website (although I keep it for the articles archived there), my mission has remained the same - I have always wanted to help women find God in the everyday busyness of their lives. I walk in those shoes. I know how crazy life can be - how hard it is to pray and focus on God when children (especially young children) need your attention, and your to-do list is overflowing with tasks. I know how easy it is to serve everyone else and forget to nurture yourself. But, we women need to feed the well first. If we aren't rooted in God, then we can't go out and serve our families to the best of our abilities. God matters. Prayer matters (even if it happens while showering, or pushing a stroller, or making supper). God is there with us in the housework and the childcare and the hundreds of tasks that fill our days. We just need to pay attention. While we can definitely find God in the extraordinary moments of life, often in a heightened way, we simply need to notice to see Him in the more simple moments. God is there in both the beauty and the messiness of life. He is there in the sunrise, and the crying child, and the toddler holding up his arms to be picked up, and a friend's smile, and the neighbor who needs a favor, and the store clerk, and the animals who share our lives, and the green sprout poking it's way through the earth, and the teenager trying so hard to figure out where she belongs in the world, and the older person so eager to share his stories with anyone who will listen, and the list goes on and on. And so, today, I invite you to pause in the midst of the craziness, take a deep breath (God is there in the air, too!) and truly pay attention to finding God in the everyday. Then, say a quick prayer of thanksgiving that God is right there with you.